Both the Men's and Women's hockey Tommies hit the road this weekend to kick off the second half of their seasons. 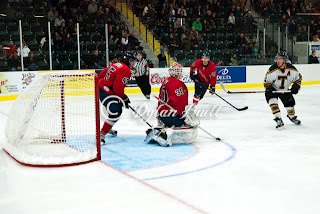 The Men will head to Halifax on Friday night and Antigonish on Saturday, while the nationally 10th ranked Women will follow suit playing in Halifax on Saturday afternoon and Antigonish on Sunday afternoon. Katie Brewster leads STU with 8 goals. The Ladies had a great first half and sit firmly in second place in the AUS with 19 points, five ahead of Moncton and Saint Mary's in third, each with 14 points. STU does have a game in hand on the Huskies, who they will play Saturday at 3 PM. The game should be broadcast online HERE. St. Thomas won both games in the first half against SMU by scores of 2 - 1 in OT in Halifax and 3 - 2 at home. There will be no easy two points against this team but with any luck the Tommies will have rookie Emily Ryan back in the line up for the first time since October 14th. On Sunday the Tommies will visit the St-FX X-Women at the Keating Millennium Centre, game time is 2 PM. Watch the game live HERE. The X-Women rolled to an easy 6 to 1 win when these two teams met on October 26th and a tight 4 to 3 win on November 16th. All hands (hopefully) will be on deck for STU versus St-FX on Sunday. If St. Thomas has intentions of winning an AUS championship this season they will most likely have to beat this team to do it. The X-Women will be waiting, can STU beat the best to be the best? The Men head into battle Friday night against the Huskies looking to push their points streak to 3 games. Game time is 7 PM and the game should be available HERE. STU sits 7 points behind 6th place UPEI for the last playoff position, so every point is an important one. The Tommies will be without Alexandre Leduc and Mike Reich for the second half, but do look forward to the return of Randy Cameron who hasn't played a game since October 20th. SMU, who currently sit in third, are in a dog fight for first place with UNB and Acadia, only two points behind the Axemen. STU pushed them to a shoot out the last time they played on November 30th, so let's hope for more of the same on Friday. 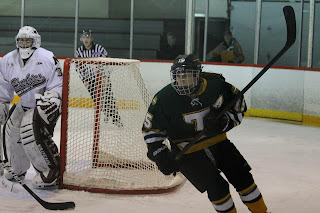 On Saturday night the Tommies head up the Nova Scotia highway to Antigonish and will take on the X-Men. Game time is 7 PM and you can watch the game HERE. STU is coming off their first home win of the season versus St-FX on December 1st and will look to knock off the 4th place X-Men again. Look for Steve Sanza, Randy Cameron, and Felix Poulin to have big games and Jon Groenheyde to continue his great play in the Tommies net. Best of luck to our Tommies in the second half.